Here is my GSD Jerry Lee. When he was younger his name was Ulrich but that changed. He was a puppy my friend started calling him jerry lee and it just stuck. He is a very smart dog and I love him dearly I was able to snag this picture of him waking me up. Hey there, Kay. It is so good to hear from you today. Thanks so much for taking the time to come here and sharing your German Shepherd Dog story with us all today. 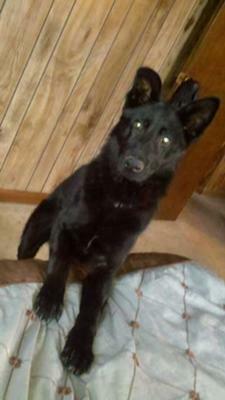 Love the picture - Jerry Lee is such a handsome black German Shepherd Dog. And that is so cute that was waking you up when you got the picture. Very nice. I'll imagine you two have a very good relationship and that is so good. There is nothing like owning a great German Shepherd Dog and maintaining a close friendship with them. Jerry Lee looks like a very handsome pup!